Jonathan M. Bryant Professor of history at Georgia Southern University; author of "Dark Places of the Earth: The Voyage of the Slave Ship Antelope"
Excerpted from Dark Places of the Earth: The Voyage of the Slave Ship Antelope by Jonathan M. Bryant. Copyright © 2015 by Jonathan M. Bryant. Reprinted with permission of the publisher Liveright Publishing Corporation. All rights reserved. MS. DIANE REHMThanks for joining us. I'm Diane Rehm. In 1820, a Spanish slave ship carrying nearly 300 African captives was caught off the coast of Florida. It set off an eight-year battle over the freedom and rights of the people aboard. In a new book, historian Jonathan M. Bryant explains why he calls the case of the slave ship Antelope the most important Supreme Court case you've never heard of. MS. DIANE REHMJonathan Bryant joins me. We'll take your calls throughout the hour, 800-433-8850. Send an email to drshow@wamu.org. Follow us on Facebook or Twitter. Jonathan Bryant, it's good to meet you. MR. JONATHAN M. BRYANTGood morning, Diane. I've very pleased to be here. REHMAnd I'm pleased to have you here because it's a story I did not know. Set the scene for us. It's 1820. Where did the Antelope set sail from. BRYANTAh. The Antelope was a Spanish slaver, but it left from Havana, Cuba, to go to Africa in the summer of 1819 to buy slaves, negros posales, they called them, new, fresh slaves from Africa to bring back to Cuba. 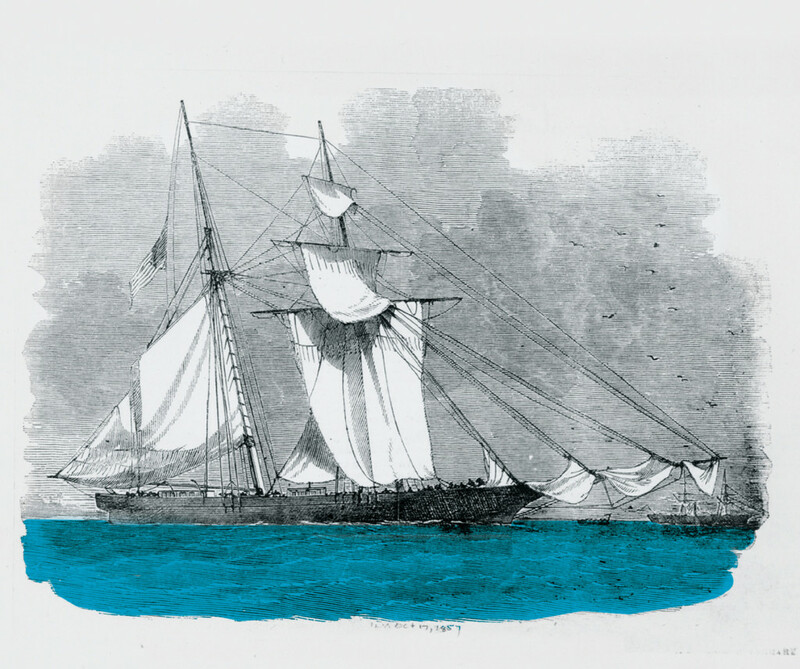 And while it was off the coast of Africa at Cabinda, a privateer out of Baltimore, but flying the flag of a predecessor to modern Uruguay captured the Antelope and all of the captives who were aboard the ship. BRYANTLoaded eventually with 331 captives, they set off across the Atlantic. The privateer was wrecked on the coast of Brazil and the Antelope continued on trying to find a market for its captives until it was captured by an American revenue cutter off the coast of Florida. REHMAnd what was the state in the United States at the time of slavery? BRYANTAbsolutely a great question. The international slave trade had been outlawed by Great Britain, by the United States, by Holland, by France, in fact even Spain had signed a treaty that by May of 1820, the international slave trade should be illegal involving Spanish vessels. But nonetheless, this slave trade continued and more than 2 million, in fact, were brought as slaves to the Americas from Africa after 1808 when the prohibition by most of the major nations went into effect. BRYANTHowever, in the United States itself, slavery was legal and slavery was thriving as it was spreading into what they called the southwest at that time, Mississippi, Alabama. REHMSo help me to understand why the ship was then taken from the coast of Florida down to Savannah. BRYANTOkay. When the revenue cutter captured the ship, under American law at that time, the captives aboard the ship were supposed to be put under the control of the president of the United States who then was supposed to arrange for their return to Africa and, in fact, there had been a congressional appropriation in 1819 in order to pay for these people to be taken back to Africa. BRYANTSo the revenue cutter brought the Antelope into Savannah. By the time it arrived in Savannah, only 258 of the original 331 captives were still living and those captives aboard the ship were so sick, so dehydrated that immediately they called for doctors and about half of the captives were too sick to really walk any distance. To make it even worse, they discovered the average age of these captives was about 14 years old. REHMAnd many had died onboard. BRYANTMany had died just -- at least 50 died before the ship was even captured and, of course, the horror of that -- because the crew would certainly just slip the bodies of these dead children -- and I'm quite sure the majority of those who died were children, just slip them over the side, must have been a horrible experience for the captives. BRYANTThis was a small vessel. Only probably about 80 feet long. Actually, a good comparison would be a 25 yard long swimming pool. Take four lanes of that swimming pool and that length of 25 yards and then put 281 people in that, which was the number aboard the Antelope when it was captured. Their conditions were terrible. It's the summertime in Florida, hot, miserable, probably sickness. And worst of all, the Antelope had been voyaging for 99 days at that time and they were literally out of water. BRYANTThese captives were dying of thirst. BRYANTNothing. Absolutely nothing. They were imprisoned at the horse racing track in Savannah. BRYANTThey thought that would be a convenient place. There's lots of stalls and stables so you can have them sleep there. The first thing the marshal did was obtain blankets, but Savannah, in the summer of 1820, was not a place one wanted to be. A yellow fever epidemic began and the captives -- the rainfall is recorded. For weeks it rained more than an inch a day. Yellow fever is raging and you have this image that the marshal wrote to John Quincy Adams and said was shocking to humanity of these children in wet blankets and nothing else in a muddy field dying. REHMYou mentioned John Quincy Adams. I think about his relationship to the ship Amistad. BRYANTExactly. John Quincy Adams was secretary of state and then became president. The Antelope case began in 1820 and continued through 1828 so Adams was at the top of his career, as far as being a federal politician was concerned. Later, when Adams was in Congress, he joined with those involved in the Amistad litigation that Stephen Spielberg made so famous in his movie. And it's not presented in the movie, but in the published version of his argument before the Supreme Court, which went on for seven hours, a third of that argument is him criticizing this Antelope decision and calling -- in essence, calling it a mistake and apologizing to the court for criticizing it, but it's a mistake. REHMJonathan Bryant, he's professor of history at Georgia Southern University. His new book is titled, "Dark Places of the Earth: The Voyage of the Slave Ship Antelope. If you'd like to join us, 800-433-8850. Send an email to drshow@wamu.org. Join us on Facebook or Twitter. I'm not quite clear why their fate was in question and why this ends up in the Supreme Court. BRYANTThis many captives, even though they might be sick and they might be young, were worth a fortune. So from the moment of their arrival in Savannah, different people began to file claims hoping to get at least a share of what would today be the millions of dollars of value that these captives represented. And then, the United States Attorney, a man who -- he's a complicated character, as all real humans are, but who is, in many ways, the hero of the story, a guy named Richard Wylly Habersham, who is the United States Attorney in Savannah, enters the case and says, no, under the law, these captives are free and that they need to be returned to Africa. BRYANTSo it became a fight over whether these captives were free or whether they would be enslaved and given to either Spanish claimants or Portuguese claimants or even perhaps the captain of the Antelope, a privateer named John Smith. What a wonderful name for a privateer. REHMI should say. And -- but it seems so strange because the process by which they end up in Savannah is illegal to begin with, acknowledged to be illegal. But once here, this great raging debate occurs. BRYANTThe argument for Spanish and Portuguese claimants was that these captives had been captured by pirates and pirates or thieves at law do not obtain property interest. They don't obtain title to the property that they steal. John Smith's argument was he was a legitimate privateer for the Banda Oriental, a predecessor to Uruguay, and that he had obtained title to these captives. If he had title, if John Smith, the privateer had title, then without question under American law, these captives should go to the president of the United States and be returned to Africa. BRYANTIf he was a pirate, then he would not keep this property, nor would it go to the president of the United States. The property would be returned to its Spanish and Portuguese owners. So that's how in the law case -- I mean, this is -- there's three big parts to this story. The first is the pirates and privateers and fightings and second's the law case in Savannah and third is law case in Washington D.C.
REHMJonathan Bryant, professor of history at Georgia Southern University. His new book is titled "Dark Places of the Earth: The Voyage of the Slave Ship Antelope. Short break here. We'll be right back. REHMAnd welcome back. Jonathan Bryant is professor of history at Georgia Southern University. He's written a fascinating new book about a ship, the slave ship Antelope, and the hundreds of slaves that came here to this country first from Spain and from Havana, captured off the coast of Florida, transported to Savannah. And then we have this extraordinary case that begins in the Supreme Court. Now we have Francis Scott Key coming into this. What is his argument? BRYANTMost people know of Francis Scott Key only as the author of "The Star Spangled Banner," and he's held up as kind of this paragon, I guess, of public patriotism. But Francis Scott Key was actually a powerful and wealthy lawyer just over in Georgetown here in Washington, D.C. He had a thriving practice and in particular was well-known as an appellate lawyer. Francis Scott Key had grown up in a family that owned a plantation with slaves. He, himself, had been a slave owner. But Francis Scott Key also had very, very powerful Christian religious convictions. BRYANTAnd he struggled, I would argue all of his life, to balance the Jesus of the Sermon on the Mount, who -- that was what he thought of as the basis of Christianity with his role as a slave master, a very difficult thing to do. One way he dealt with this was he helped create and then continued to organize something called the American Colonization Society, which American Colonization Society creates a colony in Africa that manumitted slaves and free blacks from the United States can settle, which is now of course the nation of Liberia today. BRYANTAnd so he's a very great opponent of the international slave trade, even though not necessarily such an opponent of slavery. He saw this case, and it had lingered for several years on the docket of the Supreme Court, was not being heard. At that time, the Supreme Court only had a six-week session. There would be more than 100 cases on the docket, and they could only serve, say, 30 to 40 each year. REHMAnd in the meantime, all of these individuals are held in prison? BRYANTNo, it might have even been better for them were they in prison. What they did is the U.S. marshal in Savannah put the captives out for labor. So they would labor for free. And increasingly large numbers of these captives, the healthiest, the strongest, were put to work on the marshal's own plantation, Cottingham Plantation south of Savannah. He in fact in 1822 bragged to the postmaster in Savannah that he was making $30,000 a year off the labor of the captives and that he intended to swamp them, which means to literally work them to death. BRYANTHe also at the same time was billing the federal government for the care of the captives, Unbelievable story. REHMIt is an unbelievable story, but to me one of the most unbelievable aspects of the story is how these slaves were taken in the first place, how these men were captured. BRYANTWe don't know specifics for the overwhelming majority of the captives from The Antelope. We do know a lot about the slave trade in West Central Africa, which is where these people had come from. The captives typically, half were captured in war. We tend to forget, we say Africa and have some idea of this pan-African identity, but Africa has just as many ethnic and linguistic differences as, say, Europe, and just as Europeans apparently will gladly slaughter one another, so too people in other parts of the world, including Africa, will do so. BRYANTSo about half were captured in war and then sold. Another quarter or so, according to work that was done by some British investigators, were kidnapped. And in fact one of the best voices that I have from the Antelope captives is a 10-year-old boy who was being quizzed on the docks in Baltimore about what happened. And he told how he and his sister, when he was eight years old, their parents had gone to some sort of meeting in their city, and they were playing in the yard, and men came over the fence into the yard and grabbed them, threw them over their shoulders and ran away with them. And the next thing he knew, he was on a slave vessel bound for the Americas. REHMBoth he and his sister? BRYANTApparently his sister was separated from him, and that's -- you know, that's the story of slavery writ large. You are unable to keep families together, unable to be with people. But I just think about an eight-year-old boy, 41 percent of these captives were between the ages of five and 10. I mean, they're little children. This is a child abuse story in many ways. But I just cannot imagine being onboard a slave vessel, watching people die, literally by the dozens, you yourself suffering hunger and thirst in terrible, hot conditions. It was a miserable experience. REHMHow did the 10-year-old get to Baltimore? BRYANTThat's an interesting story, too. The circuit court -- it goes to -- this case goes to United States circuit court six times, and it goes to the United States Supreme Court three times, truly, truly incredible. But the circuit court had ordered that 16 would be released and returned to Africa in 1822. So he had been taken to Baltimore and was going along with the other 15 who had been released, they'd been drawn by lot if you can imagine that, they just lined up all the captives and then drew lots for who would be freed, but they went to one of the earliest settlements of Liberia on the slave -- on a ship called the Strong that was led by Jehudi Ashmun, one of the great founders of Liberia. BRYANTBut years later, when I -- the first really good census in Liberia is 1843, they've all vanished. So I suspect they all died. REHMInteresting. How did you get started on this story? BRYANTA good question. I teach undergraduates constitutional history. And as you might imagine, it's sometimes difficult to maintain their interest in some of these cases. So I was searching for cases that had a local connection, that had a very powerful emotional component, that might engage my students, and came across the Antelope case. And I was -- it's a long case, it's not -- and it's not one to really use in class. It's 17,000 words long. But I became just totally entranced with the story and then amazed because the conclusions of this case are very important, and yet no one had heard of it. BRYANTOne brief book had been written by a federal judge, published by University of California Press, but it was focused on federal corruption in the story. So I decided about 2009 that I would write this story. When I went to the branch archive in Atlanta and looked at the district court and circuit court materials, I found more than a dozen full boxes of incredibly rich materials about this case that no one had ever used before. BRYANTAnd that was when I knew I had the book. REHMNow you have Francis Scott Key, you've already mentioned, and then you have John Berrien. REHMTalk about how the two interacted. BRYANTJohn Berrien probably is not well-known. He was Andrew Jackson's first attorney general, and had it not been for the Peggy Eaton affair, people who know history will know about this, when Andrew Jackson basically fires all his Cabinet, and he hires Roger B. Tawney as his new attorney general, but Berrien might have been chief justice of the United States had it not been for that. BRYANTBut Berrien was a very powerful and respected lawyer in Georgia. He had been a superior court judge for 11 years. He like many of these men, I mean man after man after man in this story, are graduates of the College of New Jersey, which of course becomes Princeton, he, too, had attended the College of New Jersey, but he was a very cold and forbidding man, a man of powerful logic, a man of intellect and not a man terribly well-liked by people. BRYANTBut that meant he was absolutely formidable in the courtroom. In fact, Francis Scott Key gave this incredibly impassioned speech in the first Antelope case. The first Antelope case went on for five days. Key spoke for an entire day. BRYANTHis argument was that natural law meant these men were free. He looked at the justices and said by the law of nature, all men are free. BRYANTJohn Berrien asked what's the implication of that, and the implication would be not just that these captives of the slave trade should be freed, but if by the law of nature all men are free, then all of slavery is wrong. And millions of enslaved people, then, would deserve freedom. He didn't say it exactly like that, but the implication was extraordinarily clear. REHMAnd you mentioned value. We have an email here from David. How was the value of the captives calculated? Where did the $300 number come from? And do we know exactly where the captives came from in Africa? BRYANTThat's a good - those are both good questions. David, the calculation was done by a team of three merchants in Savannah. After they -- the first decision in district court was that essentially the slaves, the captives were slaves and that they would be divided between the Portuguese and the Spanish. And so they had a big meeting in the Exchange House in Savannah and there worked on dividing them up and had to value them. Three hundred dollars was probably a low value. BRYANTAs for where they came from, probably these were people of Kikongo language groups on the coast of West Africa, people living along the Congo River, perhaps from the collapsing society of Kingdom of Congo or from places called Ngoyo and others that are along the coast there. But we honestly don't know. REHMBecause you have very few firsthand records. BRYANTExtraordinarily frustrating for a historian. I talk about voices in the beginning of the book, and the more voices you have, of course, the better you can tell the story, the better you're able to build it. And except for that one child I mentioned, I really have no voices from these captives, and that's despite the fact that the court constantly was hiring translators and that these captives themselves clearly learned to speak English very quickly. They were children. And yet their voices are not recorded. BRYANTWho I do hear from is white men, mostly from the South, and that tells you something right there. REHMYou're saying that the papers you discovered, many of them written by white men in the South? BRYANTAlmost entirely these are court documents, and there's a host of materials in there. The most moving are these continual reports, you know, I was given -- there one, I was given the girl Makia (PH), who I renamed Maria, and she has now died. And it's just report after report after report of the death of these children. REHMAnd you're listening to the Diane Rehm Show. We've got callers. Let's see, in Livonia, Michigan, Christine, you're on the air. CHRISTINEHi, Diane, thank you. Your show is just always great, and I thank your guest. And I'm so glad that he wrote what he wrote. I know he was looking at constitutional law for his students, but he touched on something that your recent shows talked about, history and getting the true story out there for people to hear. And as an African-American, to realize what slavery really was, just the idea of it, the inhumanity of it, and I just thank your guest for what he -- the work he's done. I just want to thank him. BRYANTChristine, I'm very flattered. Thank you very much. And I agree with you, obviously, it's what I do for a living, but history is extraordinarily important. If you don't know any history, you don't know where you are, much less where you're going. REHMWell, exactly, and certainly today, as we have seen case after case after case come up where race is certainly a component, I presume that none of those captured were white. BRYANTNo, in fact Francis Scott Key, who we mentioned earlier, and really his argument is spectacular, it is worth reading, but one of the points that he makes is he says had we captured a ship loaded with white captives, and the Pasha of Tripoli had claimed them as his slaves, we would never have assumed them to be slaves. So then he asked the Supreme Court why is it when we capture a ship full of Africans we assume them to be slaves. BRYANTAnd that -- I mean, we just have had the Missouri controversy. The new abolitionist movement is beginning to organize nationally in the United States. This is -- this is touchy stuff. REHMBut you also say that during the years of conflict over the captives, there were some very disturbing truths revealed about this country in its younger days. BRYANTWell, I don't know if it's confined merely to our younger days. The second part of the story that's largely set in Savannah with the legal maneuvering and also a good portion of the third part of the story, the number of conspiracies, of little criminal activities engaged in by people, I detail as many of them as I can in the book, and they are interesting, so much so that John Marshall himself, in the first Antelope opinion, looking at the claim of the Portuguese, who had never produced anyone as a particular claimant or owner, who had no data or information about anyone's investment in this -- in the voyages or the captives who had been taken from them, he basically says clearly this is a criminal conspiracy by people who do not dare reveal themselves and that it's well-known that these conspiracies are carried on under the flags of other countries. REHMHe was chief justice at the time. BRYANTChief Justice John Marshall at that time, who wrote the first Antelope opinion, that's correct. The court itself was very divided, and you get a little sense of the turbulence under the -- John Marshall always presented the opinion of the court, a very smooth thing, but the turbulence that's underneath is very interesting. REHMThe book we're talking about is titled "Dark Places Of The Earth: The Voyage Of The Slave Ship Antelope." Jonathan M. Bryant is the author. Short break. We'll be right back. REHMWelcome back. The book we're talking about this hour is titled, "Dark Places of the Earth: The Voyage of the Slave Ship Antelope." Written by Jonathan Bryant. He is Professor of History at Georgia Southern University. And it is a story of the early part of this country when slave ships came, even though international slavery and slave ships were prohibited. Somehow, this case ended up in the US Supreme Court. I am shocked to read, from your book, that the Africans who were placed in US custody were returned to Africa the following year. REHMThe Africans who remained were sold to American slave owners and their proceeds delivered to the Spanish and Portuguese claimants as restitution for their losses. With the decision of the Supreme Court, Chief Justice John Marshall reinforced that property rights are superior to the natural rights of human beings. BRYANTIt is a little shocking, but it also reflects the times. John Marshall is, of course, a complex and interesting man, the Chief Justice of the Supreme Court. He has shaped the court through the force of his own personality. And very, very dominant figure with his understanding of the Constitution. Which is that he sees it as a legal text, a superior law that then can be interpreted by the Court. When Francis Scott Key spoke before the Supreme Court, he referred to a different understanding of the Constitution. The Constitution as an example of first principles that should guide the United States. BRYANTThose first principles, of course, elegantly laid out in the Preamble to the Declaration of Independence. All men are created equal and have unalienable rights. Marshall concludes, in his opinion, that the specific laws that have been passed or made by legislatures or by treaties are superior to any sort of natural law. And thus, in this case, as he put it, in examining claims of this momentous importance, claims in which the sacred rights of liberty and of property come in conflict with each other, this Court must not yield to feeling which might seduce it from the path of duty. BRYANTAnd must obey the mandate of the law. And that mandate of the law, he found, was that property rights, superseded natural human rights. REHMAll right, let's open the phones to Roanoke, Virginia. Hi there, Andrew. You're on the air. ANDREWHi. Thank you for taking my call. ANDREWThe -- you mentioned that the -- there were translators that were hired to translate for the slaves in the -- excuse me, the individuals in the Court. And I was wondering, it would seem to me, I'm just making an assumption here, that these, the only translators you would be able to find would possibly be slaves themselves. And I was wondering whether or not their slave owners received the money that they were getting paid to translate for these individuals in the court. And I'll listen to your answer off the air. BRYANTThank you, Andrew. And boy, you are following it very well, because these captives are not considered slaves at law until the Court rules them so, so that was a good catch on your point. Yes, Michael is the name of the translator that was hired by the court several times. Michael, as far as I could determine, is a slave, though I don't know who owned him. And yes, any pay that Michael would have received probably went to his master. In fact, these captives, many of them were hired out. Slave hire was a very common practice. BRYANTIn fact, an investment in a slave often meant that you bought the slave and then you hired that slave out to someone and took the money for them. Many of these captives were hired out and the people who had bonded them received that income. And in fact, in 1826, Richard Habersham, the US Attorney that I spoke about, went before the Court and said if these are free people, why are the men who've hired them out being allowed to keep their wages? And demanded that the court return their wages to them. REHMI don't get what language the translator was using. BRYANTThat's again, and I talk about it a little bit in the book, there's a variety of languages in the region of Africa that the people probably came from. Many of them are Kikongo languages, although some could be mutually unintelligible to one another. There was also a trade pigeon language. Kikongo has tonal elements in it, like Chinese does, and so it can be difficult for Europeans to learn. So this trade pigeon eliminated those tonal elements. I don't know if the trade pigeon was what was being used or if it was one of the Kikongo tongues. REHMHere's an email from Dan in Sacramento. This book only goes to prove there is so much about slavery and slaves that America does not know. So much yet to be discovered. In your opinion, will there ever be, or should there be enough political support for reparations for descendants of slaves? Does evidence exist in corporate and government records to piece together a comprehensive record of who came from where and who is a slave descendant? BRYANTSadly, the vast majority of those who suffered slavery in the United States have vanished into the mists of the past. There is no record that's required by the government, even when the census was counting slaves. They simply said, male, age 52. No name or any other indication about the individual. The, some of the best information comes out of two sources. One is people's estates, where they would actually give more information as they were trying to balance out the valuation of inherited slaves so they could be divided equally. BRYANTThe other is material generated during reconstruction. In particular, the Southern Claims Commission, where many former slaves came in and explained about property that had been destroyed during the war and make claims for it. So, unfortunately, we'll never be able to authoritatively say absolutely who are the descendants of slaves. REHMAnd therefore, how to determine reparation. BRYANTBefore I became a Professor, I was an attorney. And in terms of the legal structure, reparations, there's no one living who can claim they specifically suffered harm directly from slavery. That said, obviously, enormous numbers of Americans today still suffer from the impact of slavery. From the fact that when, even when you're emancipated, you're given absolutely nothing. You have no capital to begin with. Often, they're trapped into what, in essence, becomes debt-pianage. You know, these are terrible stories that the United States, interestingly, in the last year or so, has begun to engage. BRYANTBut what we can do as historians is make people understand what slavery was and the impact that it had on human beings. REHMAnd here's an email from Bill in Little Rock, Arkansas. Were the captives captured in the first place by the European traders or by Africans? BRYANTYeah. I always tread carefully. Students always ask this, because some people think it reduces the guilt of European slave traders to say, oh, but Africans participated in this and sold these, in this case, mostly children. I think that's an outrageous suggestion. Just because there are people in Africa who participate in the slave trade and who profit from this, and who are therefore complicit in this entire story, so too there have to be large numbers of Americans, for example, who want to utilize slaves in order to enrich themselves. BRYANTTo basically steal the labor, even the lives of other people. And so, yes, Africans were the people who largely collected and sold the slaves to the Europeans. And the Europeans were the ones who brought the slaves to the Americas where they labored to build European empires. REHMInteresting. And to Marty in St. Louis, Missouri. You're on the air. MARTYYes. How are you doing? And I'd like to thank your guest for what he's done and I wish I was in his class. One thing I wanted to know, ask you is, one, that you told me where the Africans came from. That's one thing. But two, should the United States be responsible, and I've been looking at channel 9, and like, when the one guy had the show where people could go back and he would trace where people came from with their DNA and everything. MARTYShould America be responsible for that, and even though you're telling us that a lot of papers and things are out there right now, you know, like, there's a lot of Americans like Ben Affleck. When he found out where he came from and what his family did, he tried to, he didn't want this to be out and then there was another thing where some people wrote a book about, I think it's "Advancing the Trade" or something. They wanted to get records and stuff from the library that their family contributed a lot of money to. And the kids found out how their family was involved in slavery. MARTYAnd how they got their will. And then, they went to the library to try to get that, those papers and everything, and the library wouldn't give them to them. And that's just like me. I'm trying to find out, you know, trying to check my history, and I've been checking my history, and I found out there's been some slavery stuff going on and names have been changed. MARTYAnd everything like that. So, I feel that the United States should be responsible for people like myself who want to know where they come from and everything like that. They should pay for it. And another thing is, and this will be the last thing I have to say, is that right now, black history is thought to come, rise up thanks to people like yourself, but, you know, black history didn't really get into the schools until like, in the 70s. So, so now, you know, there's a lot of black people who don't really care or are not really interested. MARTYSo, my thing is trying to get people, black people back interested in specifically what slavery has done, created, and you know, trying to understand where we came from. REHMSure. And that is such a good point. Let's take up those issues. But let me remind you you're listening to The Diane Rehm Show. What obligation does the US have, in your view? BRYANTWell, Skip Gates' program, that I think he's talking about, where they do genealogy of famous Americans and Ben Affleck's family included a slaveholder, actually was in Savannah. Which is near where I live. I think what that brings home is that all Americans, to a degree, they don't really understand or know about, because of the historical problems Marty mentioned, have a connection, in some way or form, in many ways, to the slavery system. Slavery created extraordinary wealth. I know I'm here to talk about my book, but I will mention a book by Edward Baptist. BRYANTCalled "The Half Has Never Been Told." Which is an extraordinarily well done story of how slavery and capitalism become intertwined as slavery spreads across the United States, producing extraordinarily, extraordinary wealth for this country. But the implications of that, how there can be any sort of responsibility, honestly, I have no answer. I wish I did. REHMHow do you think the decision, in this case, affected slavery in general? BRYANT...rectitude and entitlement. And doggone-it, if enslaved people are simply property, then I should be allowed to take my property wherever I want. Which came into conflict, for example, with personal liberty laws that would later be passed, say, like, in New York. Where slave owners were told, if you bring your slaves to New York, they can be freed. And this seemed outrageous. How could that person's rights to liberty be superior to my rights of property, the slave holder would think? It also emboldened slave holders to move westward with their slaves, to continue the westward expansion of slavery. REHMAnd, you know, we think about the movie, "12 Years a Slave." A true story, based on a true story of a freed man, then kidnapped and turned back into slavery. BRYANTAnd of course, just as my book tells a very unusual story, that too, is an unusual story. Because there are thousands of people, who we've never heard of, who suffered the same sort of kidnapping and enslavement, but of course, were never able to become free. REHMWhy do you think it's taken so long for this story to be told? BRYANTI think, in part, we haven't been asking the questions about slavery and the slave trade in the way that we should have been asking them as historians. For quite a long time, we focused on victimhood. We focused on the suffering of people, and that is very, very important. But I think there is a much bigger question, which is why does this system persist for so long? Particularly when, even at the time of the Revolutionary generation, they are speaking in terms of natural rights and natural law that clearly makes slavery illegitimate. BRYANTAnd so, asking those questions about the entanglement with the economy, the entanglement with culture, the entanglement with social structures. And, of course, the growing commitment to an ideology of racism. Racism used to explain why slavery is legitimate. All of those things are things that historians have only begun to engage in the last couple of decades. REHMJonathan Bryant. His new book is titled, "Dark Places of the Earth: The Voyage of the Slave Ship Antelope," published by Live Right and, I must say, a very important book. I congratulate you.